Burdock root and carrots, finely julienned and cooked with a light and mild seasoning. 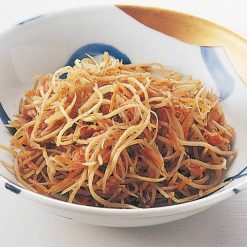 Kinpira gobo is a staple side dish that contains lots of dietary fiber (kinpira is a Japanese cooking method somewhat similar to sautéing, and gobo is burdock root). 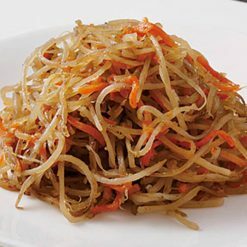 This kinpira item is made with both burdock root and carrots. They are julienned by hand into exceptionally thin strips (it is rare to find such finely sliced kinpira gobo!) and then pan-fried, leaving their crisp textures intact. Without defrosting the kinpira gobo, use scissors to make a cut in the end of the bag for air to escape; then cook for approximately 2 minutes in a 500W microwave, or 1 minute 30 seconds in a 600W microwave.Cooking times will vary depending on the model and output power of your microwave and on the amount of kinpira gobo being cooked. Please adjust accordingly. Overcooking will damage the flavor of the kinpira gobo.The bag and its contents will be very hot after microwaving. Please use caution. 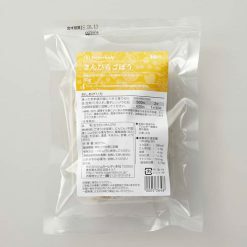 This product contains burdock root (China), carrots (China), soy sauce (contains wheat), vegetable fats and oils (rapeseed oil, soybean oil), refined sake, hon-mirin, sugar, chili pepper.. Origin of ingredients: burdock root/carrots (China). Prepared and packaged in Japan.